So, you are a sysadmin living/managing servers in Egypt or in Egypt’s timezone. Or even a good faithful linux user. 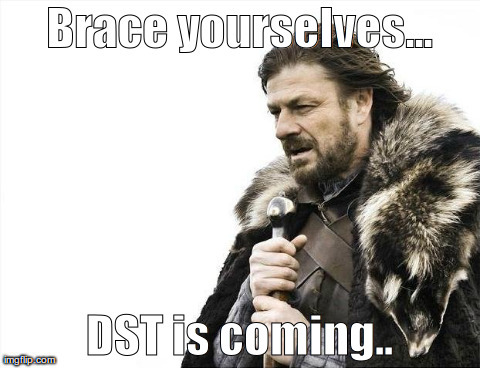 The government, in it’s infinite wisdom, decided that we should go back to DST. Are you sure you are ready for this? Since I do run servers a lot of servers in the Africa/Cairo timezone, mostly Ubuntu LTS and Debian servers, I looked to see if there is an update for the tzdata package in Ubuntu that would include this, but couldn’t find any (bug report ?). # TZ="/tmp/tzdata/Africa/Cairo" date --date="2014-05-15 01:00:00 UTC"
# TZ="/tmp/tzdata/Africa/Cairo" date --date="2014-05-16 01:00:00 UTC"
Remember that you might need to do something similar if you have any Java applications, Java timezone files are provided by the package tzdata-java. This should be it! However, this is not meant to be a permanent solution. You should update your tzdata package as soon as the next update is released. UPDATE: I just found out that the Ubuntu had released a critical update to fix this problem. You don’t need to perform these steps now, just make sure to get the latest tzdata package. Not sure about debian, yet.